This article is 3249 days old. An 11-year-old male was struck by a vehicle in the 6500 block of Walker Road around 4:45pm on Friday afternoon. The incident occurred 11 kilometers north of County Road 8 in the Town of Tecumseh near Old Castle on Walker Road in the northbound lanes. 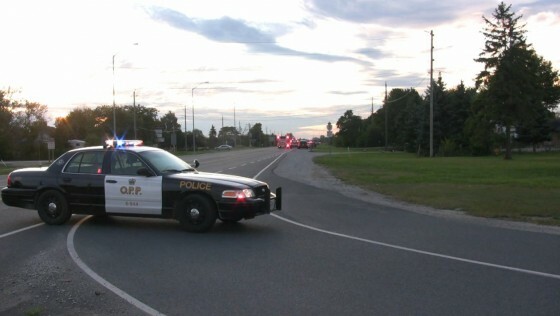 The youth was struck by a vehicle at a speed estimated to be about 80km/h. He suffered multiple fractures, but his vitals were stable when he was being transported to Hotel Dieu by EMS. It was initially reported that the child’s vital signs were possibly absent. This turned out to be incorrect. Tecumseh OPP shut down the northbound lanes of Walker Road as they conducted their investigation. Excessive speed does not appear to be a factor since Walker Road has an 80km/h speed limit between County Road 8 and South Talbot, where the collision occurred. OPP traffic investigator Constable Armstrong was sent to the scene to investigate.